It gives me great pleasure to extend a very warm welcome to you andMadame Iriana Widodo on your first State Visit to India. 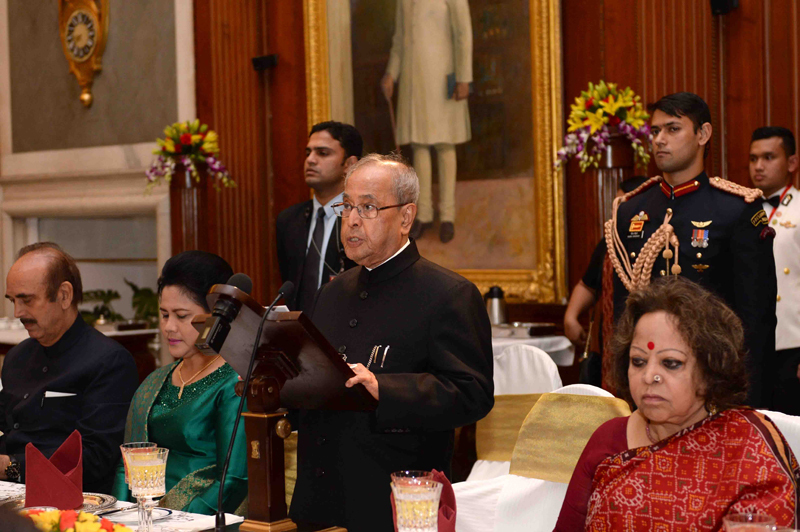 Mr. President, you represent a country with whom India shares age-oldties. These dateback to at least the Srivijaya dynasty-if not earlier, when Palembang used to be a major Buddhist pilgrimage centre. It waspart of the Buddhist pilgrim trail up to Nalanda and Bodh Gaya. These early contacts multiplied many times over in Bali, Borobodur and Java.In the 13th Century,Sufi traders and Islamic missionaries fromGujaratcarried IslamtoIndonesia – which has evolved intoyour unique brand of 'Pribumisasi' Islam–thatis at the foundations of thesocial and religiousharmony that are seen inIndonesia today.Epics such as the Ramayana and Mahabharata, Hindu and Buddhist images, Sanskrit words and names,the timeless art ofikat andbatikare simultaneously a part of ourcommon heritage and everyday life in India and Indonesia today. During our respective national movementsfor freedom from colonial rule, yourFoundingFathers– Soekarno, Mohamad Hatta, Sutan Syahrir worked in close collaboration with ournationalleaders - Jawaharlal NehruandBiju Patnaikamong others.They shared ideas and strategies, and drew inspiration from each other’s struggle -in a way thatthe course of events in one movement often impacted profoundly the other.Prime Minister Sutan Syahrir's offer of sending shipments of rice to India when Indonesia itself was under attack from the Dutch, and Prime Minister Nehru's reciprocal gesture ofdispatchingtextiles and medicines to Indonesia best capturesour greatsolidarityin those difficult days. Our founding leaders representednot just India and Indonesia, they took it upon themselves to raisethe voice ofoppressed peoplesall over the world.The Asian Relations Conferencehostedin New Delhi in March 1947, months before India became free, was an early assertion of Asian identity. The Bandung Conference of 1955, bringingtogether 29 newly-independent countries from Asia and Africa,laid the foundations ofAfro-Asian solidarity. Together Indonesia and Indiahelped to writetheclosingchapters of colonialismandstarted theNon-Aligned Movement. Today, each of our two countriesrepresents a remarkable pluralism- of culture, ethnicity, religion and language. Your motto"Bhinneka Tunggal Ika” mirrors our own slogan ,"Unity in Diversity”. We are two of the world’s largest democracies enjoying a successfulstrategic partnership; we aremaritime neighbourscommitted tothe security ofsea lanes of communication and we are both committed to overcomeradicalism and intolerance. Both our peoples believe in the power of dialogue and peaceful means – with greater emphasis on finer human values. We aretwo largeAsianeconomiesendowed with the meanstoeffectively steer Asia on a positive growth trajectory. Asforward-looking nations driven by the aspirations and hopesof ouryoung populations,we are very much instepwith each other – even 70 years afterour birth. Mr. President, in the last two years in office, you have led your country with great wisdom and determination.Your State Visit to India is taking place at a time whenwe bothseekto add vigourandnew dimensionsto ouralready vibrant agenda.Indonesia is alreadyIndia’snumber one trade partner in ASEAN-witha totalbilateral trade of close to US$16 billion; and cumulativeIndian investment in Indonesia stands at close to US$15 billion.Ourpartnershipco-operation inthe space sector is now 20 years old.In the areas of culture, education and human resource development too, weare closely engaged. I have no doubt that the talks held today and the agreements and MOUsthat weresigned willserve as a road map for the realization of our common goals. Mr. President, we look forward toworking with youto achieve the full potential of our economic co-operation, ourmaritime and air links and in increasingourreciprocal investments. We would be happy tosupport your 'maritime fulcrum vision' of Indonesia Nusantarato enable Indonesia to protect its maritime resources and integrity and contribute to the security of the Indo-Pacific. In the multilateral and global context offacing the common challenges of the 21stCentury, it is my firm belief that India and Indonesia,together, are factors of stability for theworld. With these words, I welcome you and Madameonce again. -to the enduring friendship between India and Indonesia.